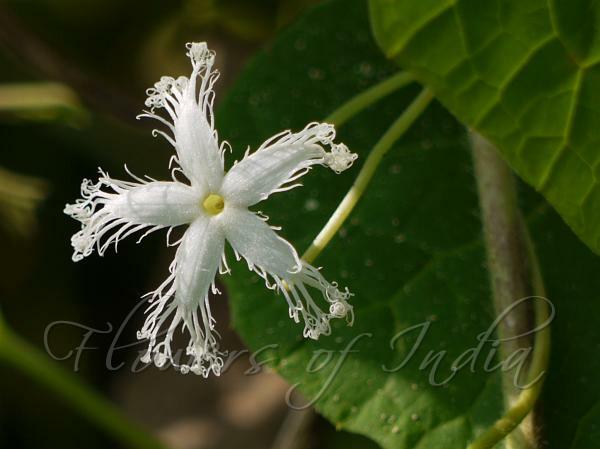 Wild Snake Gourd is an annual, stout climber with 3-fid, finely velvet-hairy tendrils. Stem is slightly velvet-hairy. Leaves are round-kidney-shaped or broadly ovate, 7-10 cm long, 8-12 cm broad, 5-7-lobed, lobes pointed or blunt, finely toothed; leaf-stalk 2-7 cm long, velvet-hairy. Flowers are white, stalked; male flowers arise in racemes, flower-cluster-stalks paired, one 1-flowered, the other many flowered; female flowers solitary. Calyx-tube is broadened at tip, about 3 mm across, sepals minute. Petals are lanceshaped-oblong, with decorative lacy threadlike structures on the margin. Staminal filaments are about 2 mm long. Ovary is oblong, style 1.5-1.8 cm long. Fruits are ovoid-spindle-shaped, 5-6 cm long, 3.5-4 cm broad, pointed at both ends, white striped when young, red or orange when mature. Seeds ovate-oblong, 11-12 x 6-7 mm broad, enclosed within red pulp. Wild Snake Gourd is found in India, Pakistan, Sri Lanka, and parts of SE Asia. Flowering: June-October. Identification credit: Navendu Pagé Photographed in Maharashtra & JNU Campus, Delhi.